A gay guy meets an accident and gets washed up in a remote island. When he wakes up he doesn't remember anything, including his gender orientation. After developing a romance with a barrio lady, things get crazy when his boyfriend is able to locate him. Ballesteros gives another award-winning turn as a man who loses his memory after being swept away to a remote island. He is found by a compassionate couple, Lander Vera-Perez and Maricel Morales. Carrying nothing on him, the poor guy cannot even remember his identity. The couple’s daughter, Yam Concepcion, is immediately suspicious of him. She thinks he is fleeing from the law – or is faking it. But she is left with no choice but to let him stay in their home. Romance starts to brew between the two, but this amnesia patient displays some acts that are not exactly manly, and finds himself distracted by the sight of attractive men. When somebody from his past comes to shed light on who and what he really is, the answers befuddle him further. This outlook is shared by director Albert Langitan, who has worn different hats in the world of local production. He started out as a scriptwriter, then went on to direct reality shows and teleseryes such as “Impostora” and “Super Ma’am.” It is interesting to see how Langitan’s creative eye and Ballesteros’ passion for his craft work together to bring viewers a laugh-out-loud movie that’s hard to forget. Adding spice to the film is VIVA’s versatile actress, Yam Concepcion who was first launched to stardom via Erik Matti’s adult drama “Rigodon.” “Amnesia Love” is Paolo and Yam’s reunion film. They worked together in the 2016 blockbuster movie, “Bakit Lahat ng Gwapo May Boyfriend? !” with Kapuso star, Dennis Trillo and Anne Curtis. Joining Paolo, Yam, Lander and Maricel in the cast are Polo Ravales, Vandolph Quizon, Geleen Eugenio, and Sinon Loresca. 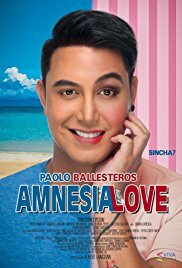 “Amnesia Love” is showing in cinemas starting February 28.